Sophie Battell (Cardiff University) will be presenting a paper on “Hospitality in Shakespeare” as part of a panel on “Faire la fête à la Renaissance: Renaissance Feasts and Festivals” at this year’s Renaissance Society of America conference in Berlin. Shakespeare’s dark ‘middle comedies’ depict rituals of feasting in interesting, but often uneasy ways. In Troilus and Cressida, when the city of Troy is at war and under siege, the risk of offering hospitality to one’s enemy is great. The play presents blended moments of hospitality and hostility mixed, as when the Greek warrior, Ulysses describes his intended entertaining of the Trojan warrior, Hector: “I’ll heat his blood with Greekish wine tonight, / Which with my scimitar I’ll cool tomorrow. / Patroclus, let us feast him to the height”. 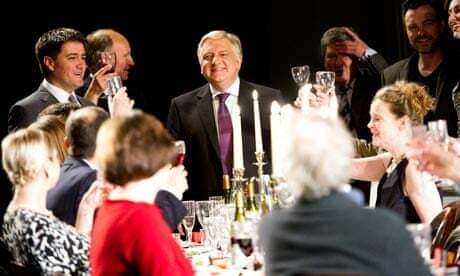 In Timon of Athens, meanwhile, the relentless show of hospitality’s maimed rites and broken banquets is perhaps what has led so many modern critics to describe the play as difficult and essentially ‘unpalatable’. My paper aims to demonstrate how Troilus and Cressida and Timon of Athens invert rituals of feasting, leading to moments of dark theatrical spectacle. height of Fall – has the good sense to miss the most sessions. modern and current practice and its influence on performance). conference in a third book. abstract is 31 May 2011. 540-885-5588 x28 for more information.